If you are looking for a quick and easy way to impress your family this year at Easter brunch, bring some cupcakes. Seriously. Cupcakes (the kind you buy in the box, obviously… this is ME we’re talking about here) take NO time to make and with a tiny bit of effort you can look like a crafty, cupcake queen. Easter is the perfect holiday to show off your skills, since there are SO many cute ideas out there. This year I am trying a design I saw on ‘The Chew.‘ They visited a cupcake factory and one of the employees showed them how to make them. But the steps were never put on their website (that I could find) so I just went by memory and I LOVE how they turned out. This is my run-through version, and I will make them again this coming weekend before our Easter brunch. All you do is cut the marshmallow in half (diagonally) then dip it in sprinkles or colored sugar. Then you can use whatever you like for the face. I did a few variations of this, I think I will buy some mini M&M’s to make the faces for this weekend. These adorable flower cupcakes were in my Family Circle magazine, and since I was already working with marshmallows & colored sugar from the bunnies, I figured I HAD to give these a try. They are time consuming, but easy enough that it doesn’t bother me. I just had Hudson dip them in the colors while I cut them, so the process went pretty quick. I have NO artsy/crafty skills whatsoever, so I was SUPER IMPRESSED with how these turned out. Hudson was even more impressed. He said, “Mom…You are a artist of cupcakes! No one has ever made cupcakes like these!” Then I showed him the Family Circle magazine. Anyway, they are definitely a show stopper & I will be making more this weekend to mix with the bunny ones. A few years back, I made ‘egg nest’ cupcakes and those were a big hit. I have to be honest though, they were a huge pain to decorate because the edible grass I got kept breaking apart and it wouldn’t hold its ‘nest’ shape. The whole thing just made me angry and I swore I would never make them again. With that being said, this year I saw some licorice style edible grass that looked like it would be a much easier to work with. So if you feel like tackling that one… go right ahead. All you need to decorate the cupcakes is that edible grass and chocolate eggs. (jellybean eggs would work too) Let me know how it goes, maybe a few success stories will convince me to brings these back next year!What are some of your favorite Easter treats? they look hard. no time, huh? hahaha! I promise!! The bunny ones take no time.. the flower one… um… maybe 4 minutes a flower. I going to try this with my nieces this weekend. If I have any leftover I will bring them in on Monday! I am making a fresh batch for Easter. Almost to pretty to eat…almost! Very cute! Pinning to my Easter board! I know! And they look so cute too! Thanks for taking the time to comment! I know, my son even hesitated (for a QUICK moment) before eating the flower one! Thanks for stopping by! Thank you for stopping by! I loved the creative ways to decorate Easter eggs on your blog! I pinned it! 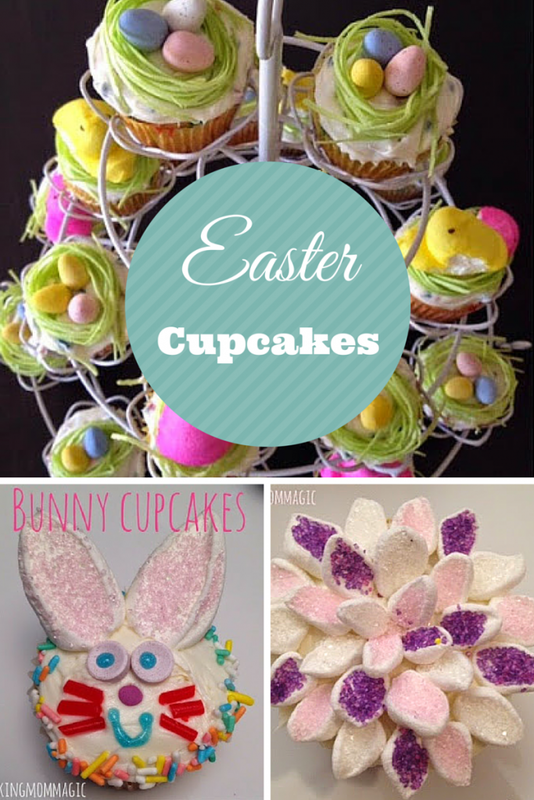 These bunny cupcakes are adorable… We love all sweets and these are so awesome! Thank you! I am excited to see the other kids reaction to them on Sunday! Thanks for commenting! Cute cupcakes. I love the flower ones. I love these. You are so creative! super cute! Pinning and tweeting…you're crafty! These are the CUTEST things ever! Love it! Pinning to my Deliberate EASTER board. Thank you! Those flowe5rs ones are really good too, since I love marshmallows! !